It is Christmas Eve - Everything is wrapped, handmade gifts are finished, house is clean, and I'm just waiting for the party to start. Here is the last Christmas project of the season! Thank you God for giving us your precious Son. God bless you all! I made sets of thank you cards to give as Christmas gifts. 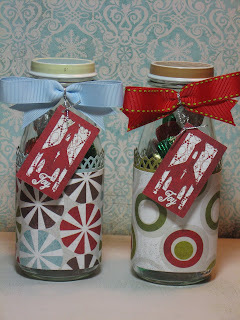 These cards were made using Basic Grey Figgy Pudding paper and odds and ends from my stash. I put the sets in simple clear envelopes and tied with silver cording. For the card above, I used prima flowers and embroidery floss. The little squares was cut with a Martha Steward postage stamp punch. The circles were cut out with my Cricut at 3/4 inches. You could also use a 3/4 inch circle punch, whichever you have on hand! I used the Creative Memories circle cutting system to cut out the center circle and the red frame. The letters are from The Girls Paperie. The thanks sentiment was cut out using the Beyond Birthdays Cricut cartridge. I cut this cake from the Sweet Treats Cricut cartridge to create this wedding shower card. I used tiny Prima flowers as the cake decorations. This cake cut can be used in so many ways. It would make a very cute birthday card! Here is a quick video showing how to load the ATG 714 adhesive gun. This tool is a must have for paper crafting! It is a very economical tape adhesive. You can now purchase it at your local Michael store with a coupon!! 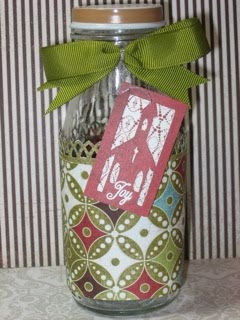 Here is a Christmas gift made from a Starbucks Frappuccino bottle. I used the Winter Woodland Cricut cartridge for the tag. The paper is Figgy Pudding from Basic Grey. I filled the finished bottles with candy and gum. I ended up making 20 bottles using different papers from the same paper collection. Here are a couple variations. 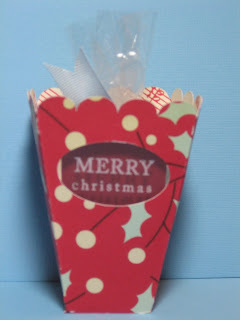 Here is another gift project. I used the Cricut cartridge Bags, Tags, Boxes & More for this little popcorn box, and the paper is Merry Berry from Cosmo Cricket. It doesn't show up well in this picture, but I used a sheet of transparency for the sentiment in the window. It shows up much better in the video!